I want to give you a roadmap for our program. We will not be delivering individual papers but, rather, hope to have a discussion. We are planning to spend thirty minutes on introductions for the purpose of allowing you to identify the source of each panelist's perspectives. We will then use an hour, more or less, for a discussion among the panel. That will leave fifteen minutes for audience questions and participation. Because we will be publishing an edited transcript, we ask that you hold your questions until the end. Access to justice is a broad topic, and we cannot cover everything. You will notice a few major omissions. Most notably, we are not going to emphasize consumer pre-dispute arbitration agreements. This is not because they are not important, but because much has been written and said on this topic, and it could easily swallow the whole discussion. Also, we are probably not going to say very much about restorative justice, and I am sure you will notice some other holes. We invite you to raise missing issues in your comments. Let me start with a few opening remarks. 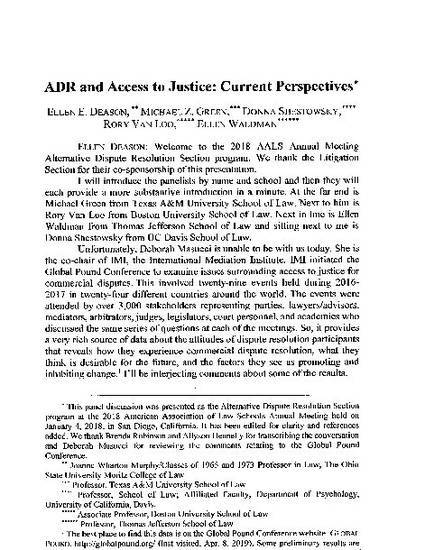 We are building upon earlier panels on access to justice at this meeting. At the ones I attended, I have heard two different themes. One is about the availability of lawyers and the value of legal representation, emphasizing that having a lawyer is a key aspect of access to justice. Another theme asks whether the legal system is providing justice aside from the question of adequate representation in individual cases. This critique emphasizes the extent to which the litigation system is stacked, and ways in which laws fail to recognize the individual realities of the disadvantaged. Both these themes are highly relevant to the role of dispute resolution in access to justice.